Howdy everyone! 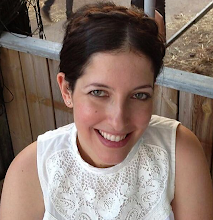 I'm Allison Cope and welcome to the last day of February! 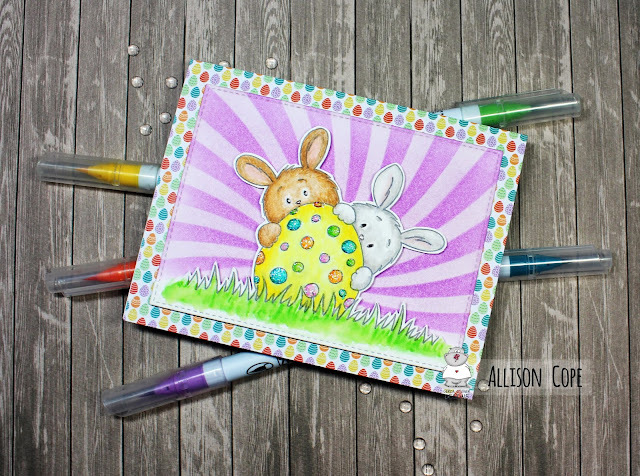 Today we're going to be doing some watercoloring with our adorable FREE digital stamp, Easter Bunnies today. We are going to working with ZIG Clean Color Real Brush Markers on Strathmore's Bristol Smooth Surface Watercolor Paper. 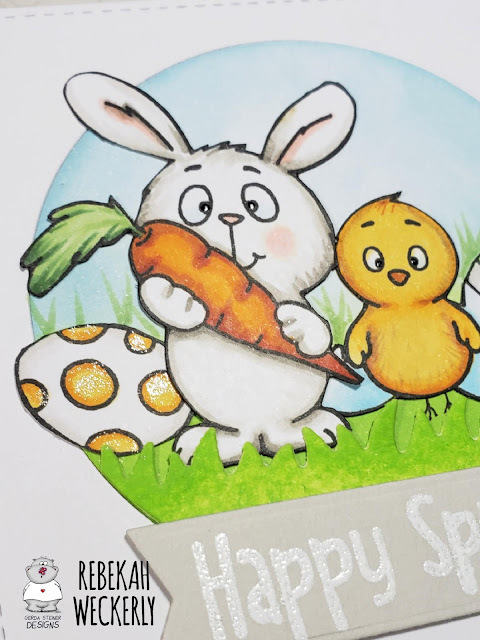 To download our FREE "Easter Bunnies" digital stamp, click HERE. 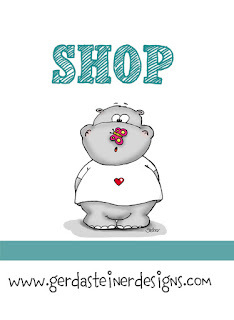 To check out all the fun digital images from Gerda Steiner Designs, visit HERE. We always something new popping up in the shop! I hope you too will give watercolouring and digital images a try! See you again soon! I hope your week is off to a great start! 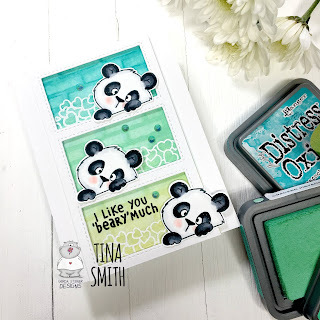 I used Distress Oxide Inks and a Brick Stencil to create my background and just had to use 3 of these Lovely Pandas. 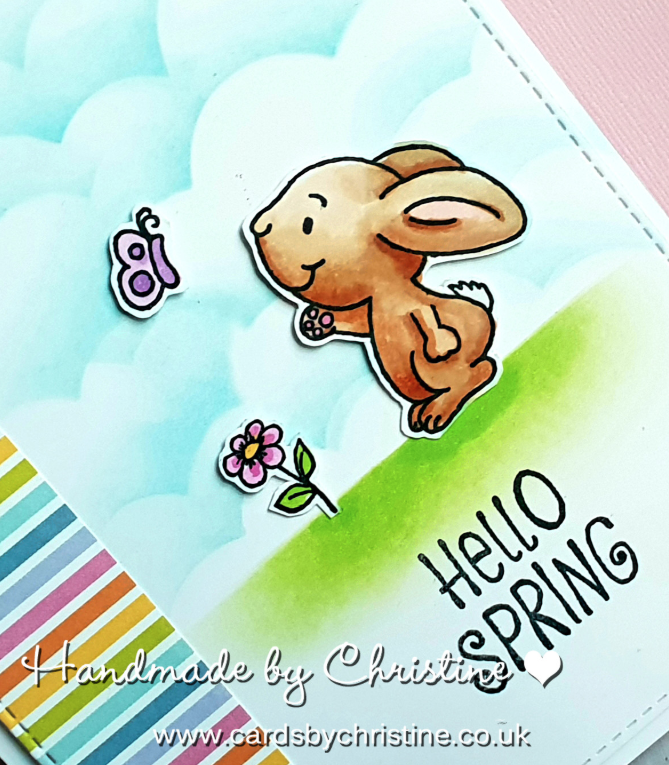 For more details you can watch the tutorial on how I created this card down below. Hello friends! 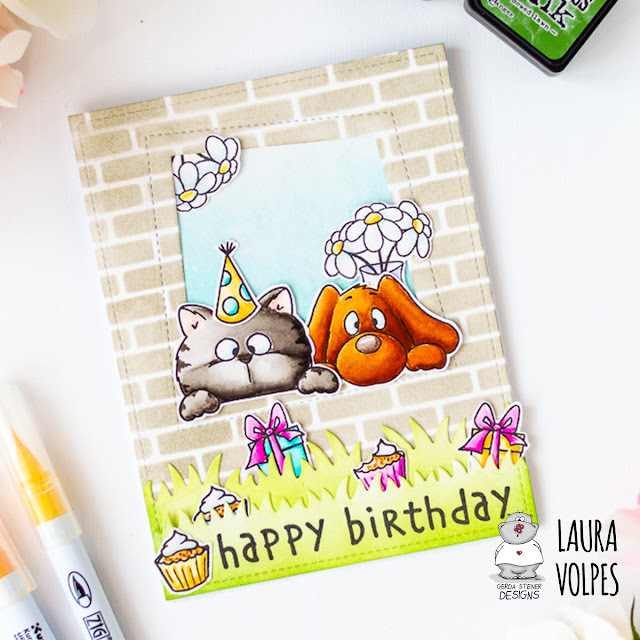 Karla back today with a sweet little birthday card full of brightly coloured rainbow details using the most adorable Birthday Bear Digital Stamp in the Gerda Steiner Designs Shop. 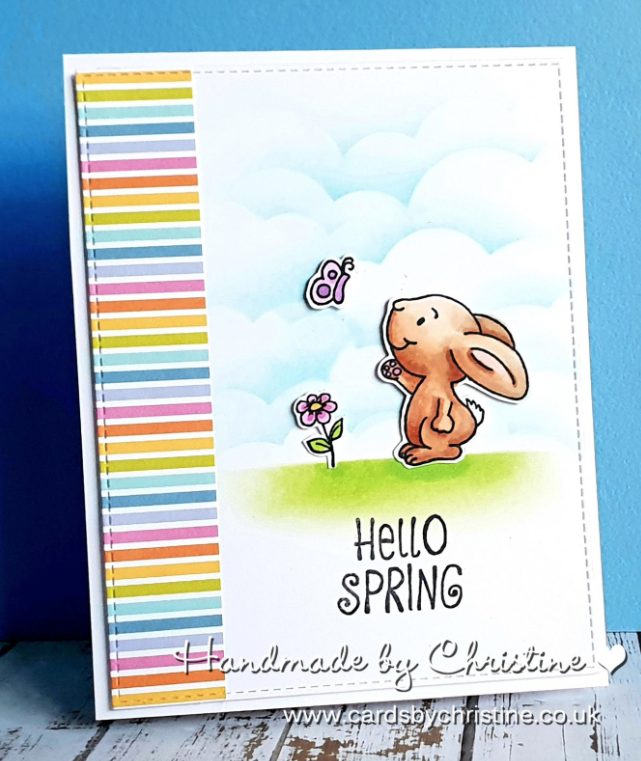 We've had a long winter in Alberta, Canada, and the past month has been really cold, so I am totally ready for rainbows and sunshine! I started off by printing this guy onto white cardstock and then colouring him in with rainbow colours using Copic and Prismacolor Markers, both alcohol based. 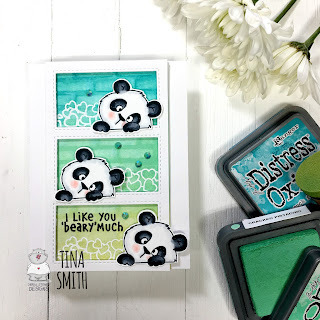 I used some fun Heidi Swapp Color Fresh paper layered on my card base and added some diecut and ephemera details along with some pretty embellishments from Buttons Galore and More. A bit of Glossy Accents and Stickles add some great detail to this guy's yummy cake! Thanks so much for stopping by today! 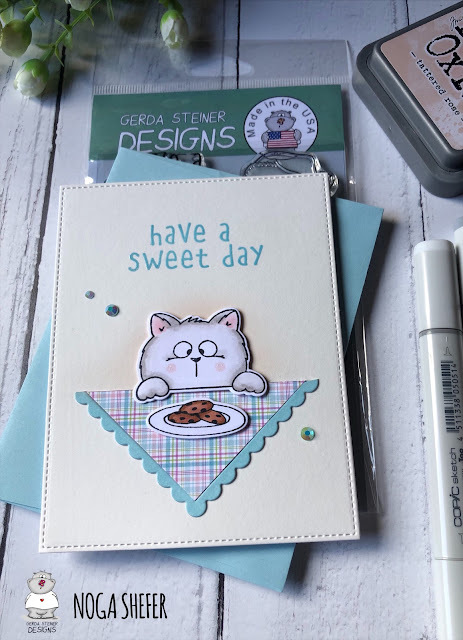 I hope you have an awesome week, and don't forget to check out the Gerda Steiner Designs shop to see what catches your eye! This time I have made a card with the digital stamp Dog and butterfly from Gerda Steiner designs. I have coloured the image with my Polychromos pencils. 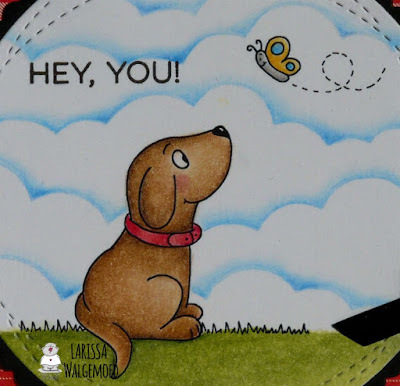 I used the Mini cloud edges stencil from My favorite things and a blue pencil to colour the clouds. I have die-cut the image with the Stitched wonky circle stax from My favorite things. I have die-cut a scalloped circle from black cardstock with the Crea-nest-lies XXL 53 from Crealies. I have stamped a sentiment from the set More essential sentiments from My favorite things on the circle. On a white card I glued a piece of red design paper from the Designer sheets - Tartan - Bright colours from Card deco after I tied a black ribbon around it. Then I glued the circle with foamtape on the card. 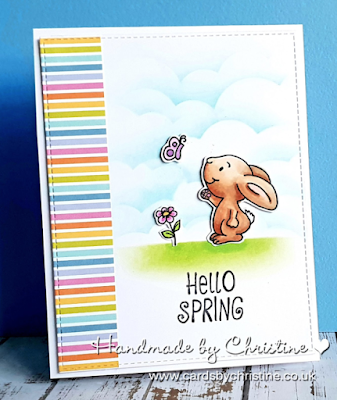 It is still blowing snow where I live but it is not stopping me from thinking about Spring! Hello! Its Rebekah with you this evening sharing this card made using the Hello Spring Stamp set! There are tons of great Spring images in this set but I chose to use just the chicken and the little chicks. 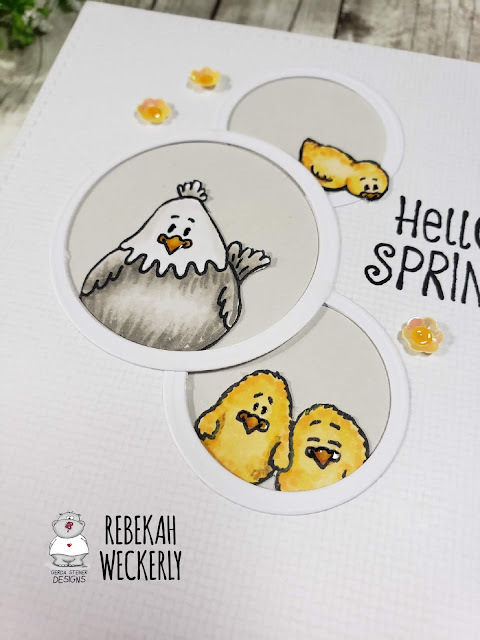 I used circle dies to create small frames and layered them to create this design. Super easy and I love the clean and simple look! I colored all the images with copic markers and added a little detail with colored pencils. Be sure to check out this set. There is something it it for every single Spring occasion you can think of! For today's card I have used the 'Dog and Butterfly' digital stamp. The image has been printed onto Copic X-PressIt blending card and coloured with Copic Markers and watercolours for the background. I have them cut this with a stitched rectangle die. This is the base card. Take a piece of white card and cut it using the same stitched rectangle die. Then using the stitched cloud die, cut again on an angle. Adhere this to the base card. Stamp sentiment using black ink. Apply glossy accents and glitter to the butterfly and allow to dry. 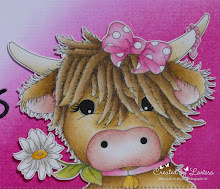 Hello, I am Larissa from Car-d-elicious and today I am posting a card on the blog from Gerda Steiner designs. 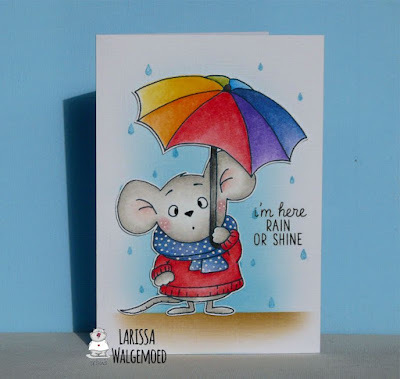 I have made a card with the digital stamp Umbrella mouse from Gerda Steiner designs. 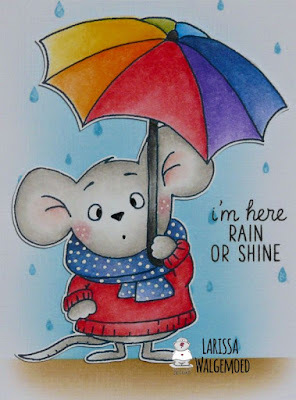 I have coloured the mouse with my Polychromos pencils and the black glaze pen. With a white gelpen I have added dots on the scarf. I have fussy cut the mouse. On a white card I added a strip of masking tape and then I made a floor for the image with Brushed corduroy and Gathered twigs Distress ink. With Broken china Distress ink I have added a sky for the image. In the sky I stamped a couple of raindrops from the set Chance of rain from Mama elephant with Broken china Distress ink. I glued the mouse with foamtape on the card. 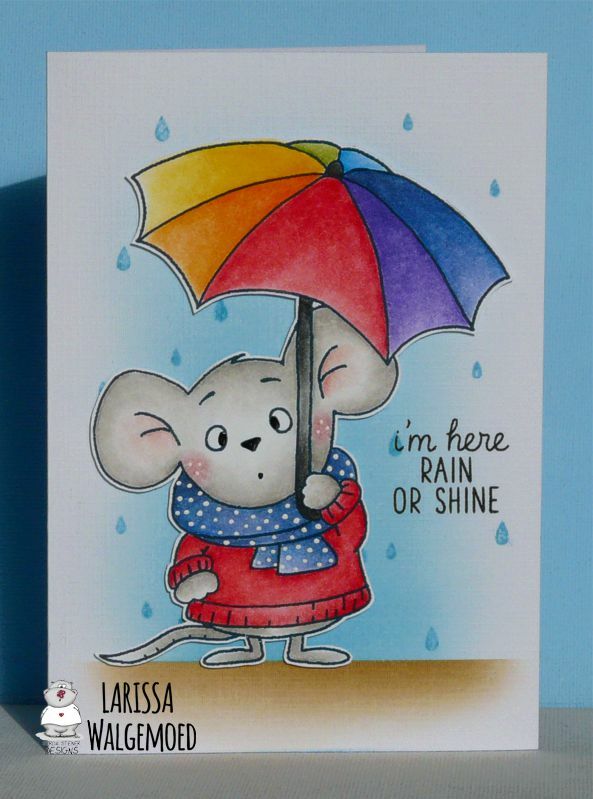 Next to the image I have stamped a sentiment from the set Chance of rain from Mama elephant. Hi everyone! It’s Jeannie (InsideoutJeans) here today with a card I made along with a video showing the process for creating this card. Today, I’m featuring Gerda Steiner Designs, On The Table along with the Hoppiness stamp set. I created a scene card a couple weeks ago featuring the kitty and the puppy peering over a table at some cookies. 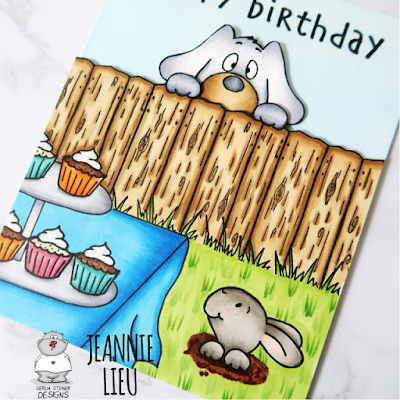 While creating that card, I thought about the fence in the Hoppiness set. It's one of my favorite accessory pieces in a stamp set since it is super versatile. It's no different for this card as I used it for the dog to peer into a backyard during a cupcake party. The best part of this card is that the two sets work so well together. The only added piece was that I had to draw in the table for the cupcakes to sit but the scene creates itself. 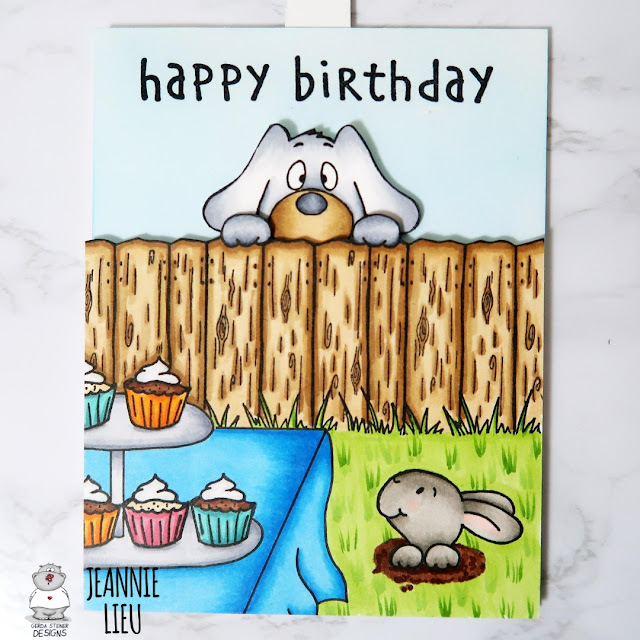 My original idea behind this card was that the dog would pop up peering over the fence and to create this I needed to mask off the dog so that I have just his two paws over the fence as well as stamping out the dog and drawing in the rest of his face without the paws. If you are curious about how I created it, I'm including the video link. You'll see that I encounter some issues creating the slider channel for the pull up card but I was able to figure it out. With any card, there are some challenges, but you can normally figure a way to fix it. 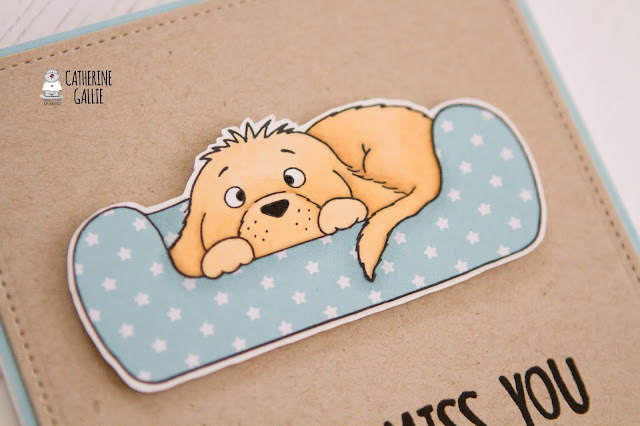 When the recipient pulls up the card, the doggie pops up. I also really love that I added the bunny popping out from the ground in the scene as well. It adds a little something extra to it. For this card I used the super cute set "Lovely Pandas"(co-ordinating dies also available). I just adore this set, it can be used for many themes of cards!! I used a couple of Catherine pooler inks for my background in the colours tutti frutti and bellini. I blended them until I was happy with the blend and the spritzed with water for a cool effect. 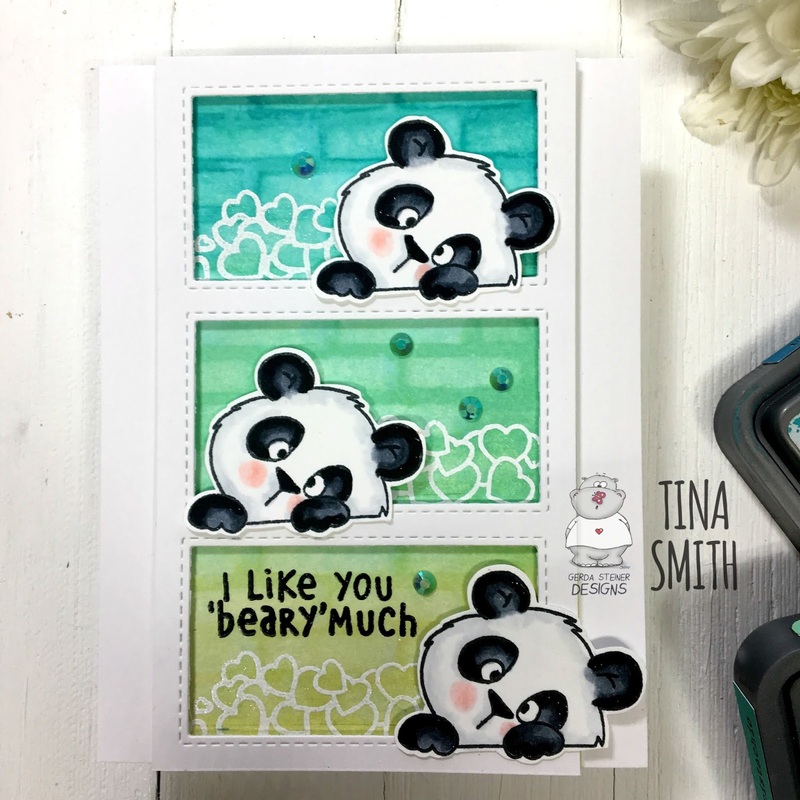 The panda is coloured with my fave medium Copics except for the balloon which I coloured with a WOW embossing pen and then heat embossed with sunset boulevard embossing powder. 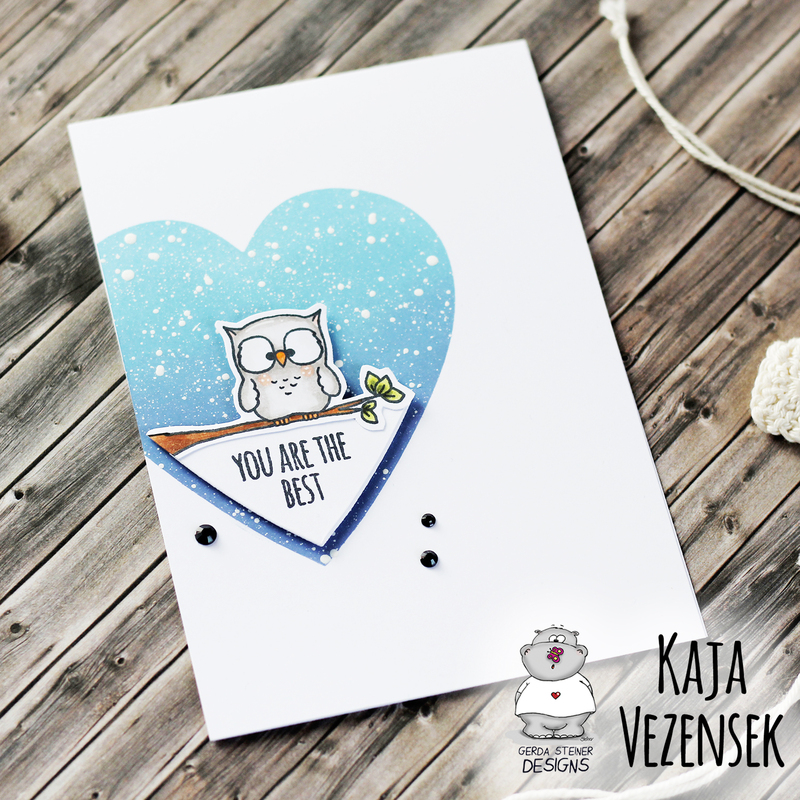 The xoxo sentiment is also heat embossed with WOW opaque white powder. I hope you enjoyed my latest Gerda inspiration. Happy crafting, till next time Ashlee. To make this card I took an A2 panel of Bristol smooth cardstock. The background was created by blended tattered rose distress oxide ink. Next I glued a pic of plaid paper to the background to create a table. Next I colored the images using copic markers. I glued all the images to my panel with foam tape for dimension. Next I stamped a greeting from the stamp set using tumbled glass distress oxide ink and heat embossed it. To finish off, I added a few sequins for decoration. 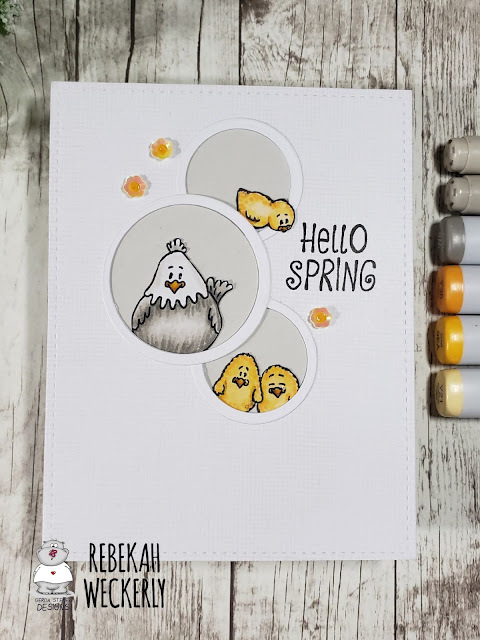 I hope you enjoy the card I created and feel inspired to create! Hello, crafty friends! 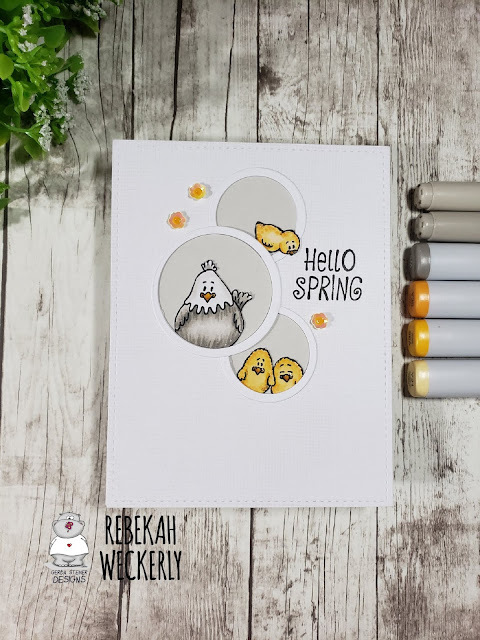 It's me, Rebekah, here to share a card I made using a stamp set from the new collection coming soon to Gerda Steiner Designs! 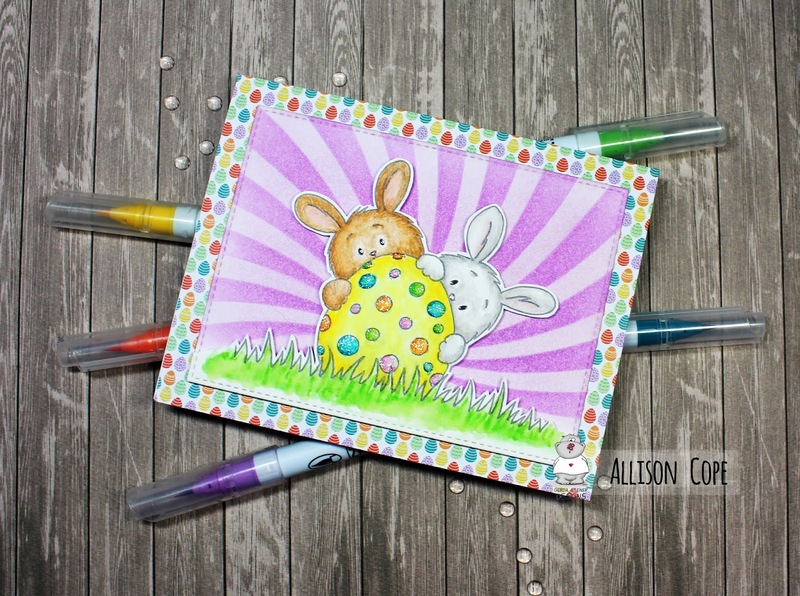 Easter Bunnies is the name of this set and look how adorable these little images are! 1. 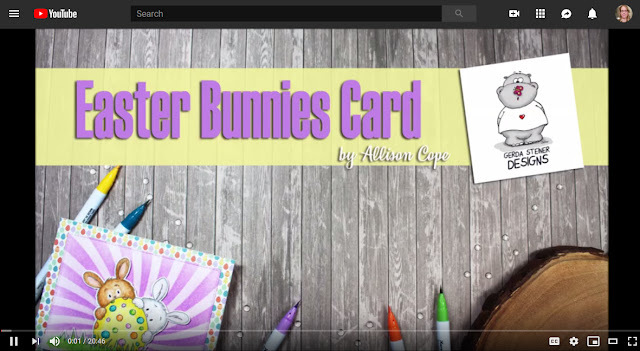 On a 4 1/4 x 5 1/2 piece of light gray cardstock, randomly stamp the Easter egg using a similar color ink. 2. 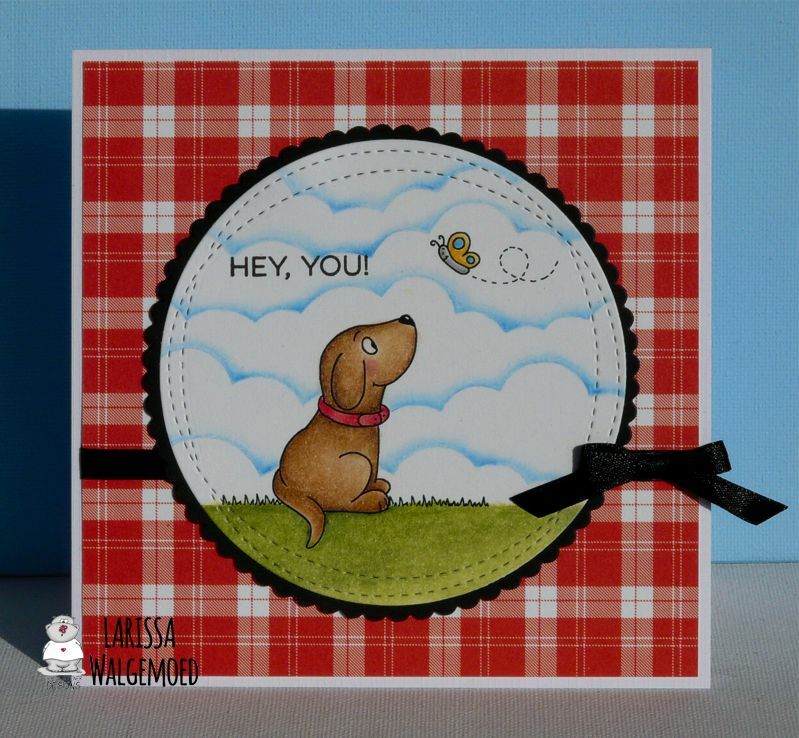 Use a rectangular die and a circle die to create the top panel. Glue to gray cardstock. 3. On the die cut circle, ink blend green on the bottom for grass and light blue on the top for sky. Add a few wispy pieces of grass with a Copic marker. 4. Stamp images and color. Fussy cut and then arrange your scene. Adhere to die cut circle. Add a strip of die cut grass. 5. 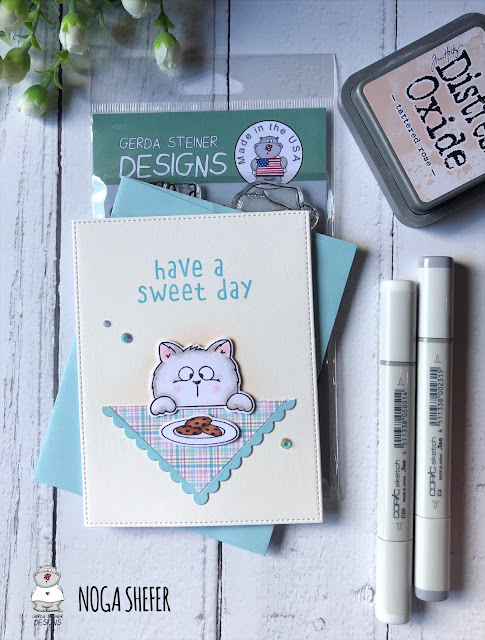 Stamp sentiment in Versamark ink and heat emboss with white embossing powder. Add to bottom of circle and adhere to the card base. 6. Add a little sparkle here and there with a glitter pen. Hi everyone! 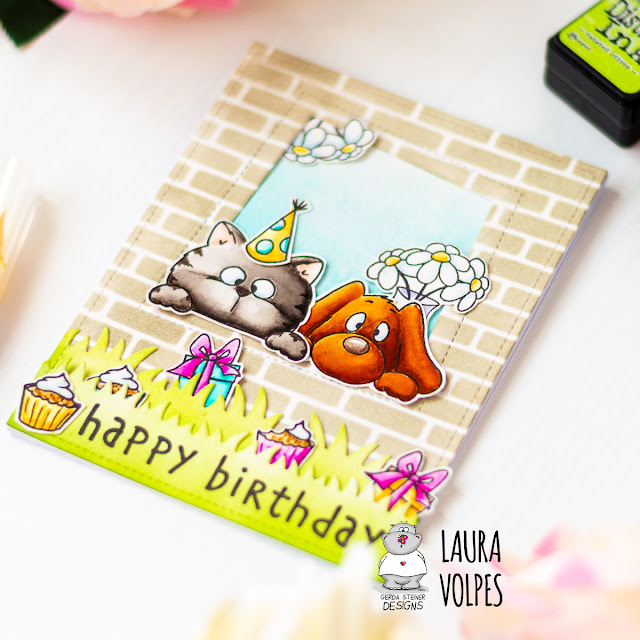 It's Laura here, and today I am back with a window birthday card I created with the Gerda Steiner Designs On the Table stamp set. At the end of this post you can also find a video tutorial showing how you can make it too! For my card base I die cut some more Bristol Smooth Cardstock by Strathmore using the an A2 stitched rectangle die. I then die cut an opening in the panel, which will be the window where the critters will peek through. I blended Distress Ink in Pumice Stone through the a stencil to create a brick wall effect. I die cut two grassy borders and blended Distress Inks in Mowed Lawn and Twisted Citron to add color and dimension to the them. 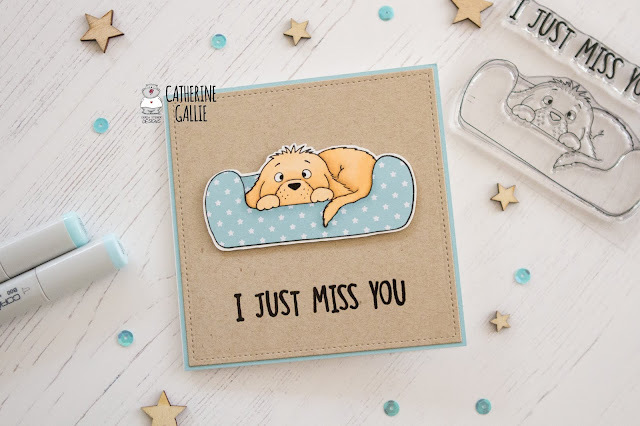 If you want to see the cardmaking process in more detail, you can watch the video tutorial below.